According to the San Antonio Metropolitan Health District, there have been more than 180 confirmed cases of Salmonella since Sept. 5th. If you or a loved dined at Pasha Mediterranean Grill recently and experienced nausea, vomiting, diarrhea or stomach cramping, call the Hill Law Firm – we can help you today. The consultation is free and we never charge a fee unless we recover compensation on your behalf. Call (210) 960-3939. With food recalls being announced every other week, food poisoning has become an often discussed issue in the media, yet few people understand the risks. The CDC estimates that each year roughly 1 in 6 Americans (or 48 million people) get sick, 128,000 are hospitalized, and 3,000 die of food-borne diseases. Many of these instances of food borne illnesses are completely preventable by the food industry. Instead, poor sanitary conditions in food processing plants, improper storage and handling, and other bad acts on behalf of the food industry cause many of people to get sick through no fault of their own. Food poisoning (also known as food-borne illness) is any illness that results from eating contaminated food or being exposed to food contaminated with bacteria, chemicals or other pathogens. Food poisoning oftentimes will lead to sickness, but sometimes is very mild and goes unnoticed. Food poisoning is a reportable incident and is tracked by government agencies to contain, prevent, and control outbreaks. How Prevalent is Contaminated Food? Food poisoning is much more common than the average person understands. The Centers for Disease Control and Prevention (or “CDC”) estimates that roughly 1 in 6 Americans will experience some degree of food poisoning in any given year. Unfortunately, in many years, thousands of people will die from food poisoning in the United States. What are Different Types of Food Poisoning? These pathogens can lead to serious injuries like hemolytic uremic syndrome (HUS), Pig-Bel disease and even death. If you’ve gone out to eat and soon afterwards found yourself feeling sick, you may be asking yourself, “can I sue for food poisoning?” A food poisoning lawsuit is complicated, but you may have a case. Food poisoning falls under product liability claims. You’ve been sold a product- the food- and it’s injured you via the poison. This may not be what you’d immediately expect a food poisoning case to be like, but it’s how the courtroom commonly treats it. Depending on the nature of your food poisoning lawsuit, the state of Texas may require you to furnish the evidence, or it may relieve you of this burden. Proving your food poisoning occurred from a restaurant is often the hardest part of a food poisoning trial. Regardless of whether or not you and your attorney have to collect the evidence, there are certain things that will make your case easier. Do you know what your illness is? If your doctor diagnoses you with food poisoning, ask for more details. Common pathogens include E. coli, Listeria, Norovirus, Hepatitis, Salmonella, and Vibrio. Knowing what sort of virus you have is often necessary for your case to proceed. Do you need to run PFGE tests? PFGE stands for Pulsed-Field Gel Electrophoreses. This test is the equivalent of dusting a crime scene for fingerprints, except you’re pulsed-field gel electrophoresing your crime scene for bacterial genetic prints. If the specialists find these prints in the restaurant, and on other sick customers, that’s solid evidence you can use in court. Do you still have your leftovers? If you do, don’t throw them away! Your cold food could be the hot, smoking gun needed to link your illness to the restaurant you’re suing. This evidence may be hard to establish, especially alone. A lawyer can be a huge relief while you’re already suffering from a sickness. There are some additional factors to consider as well, which may give your food poisoning case more traction. If you’re not sure which food exactly you ate was the culprit that made you sick, you may still have a food poisoning claim. And even if the pathogen came from a sick employee, rather than the food directly, you may still be able to sue the restaurant. If it’s discovered that the restaurant was grossly negligent, you may have a claim for punitive damages, too- this means that the restaurant has a history of health code violations, or has not sent sick employees home when it should’ve. Punitive damages are often far greater than a normal suit would award. There may be time limits regarding how long you can wait before you sue a restaurant or other parties found liable for your food poisoning. So if you’re asking yourself, “can I sue a restaurant for food poisoning?”, don’t delay! Contact us to confidentially discuss your options immediately, at no cost to you, by using form below right away. The food poisoning attorneys at Hill Law Firm have experience taking on some of the largest companies in the world in food-borne illnesses lawsuits. 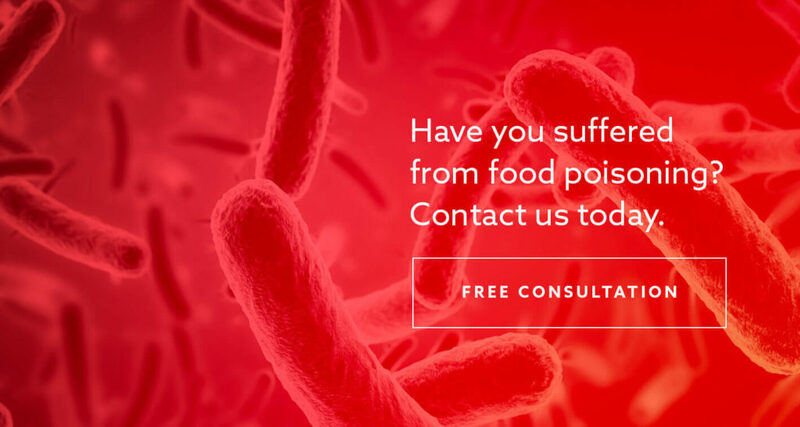 If you or a loved one have suffered injuries or wrongful death due to a food contamination or food poisoning, please call the experienced personal injury lawyers at Hill Law Firm today for questions or a free case evaluation. It is extremely important that you contact an attorney quickly to protect your rights.